I feel extremely fortunate to be in a very happy partnership with my love Charlie. I knew she was the right woman for me when I woke up one morning and she was listening to Alban Berg's violin concerto (not exactly your regular top 40 breakfast music). "Why are you listening to Berg's violin concerto?" "Oh, I hadn't heard it for a while. It's good to keep across these things." And that was that. We may have our ups and downs (oh ok, I can be pretty annoying), but whenever we have a bit of a "discussion," we both know that listening to some music will calm us down. And two composers work especially well. Bach, and Joni Mitchell. When I came home the other day, Charlie said she'd booked tickets to see Joni Mitchell's 75th birthday concert. It was a special one-night-only screening at a few cinemas around the world, and it was on Bach's birthday (21 March). A bunch of famous singers (a throat of singers?) - Seal, Chaka Khan, James Taylor, Diana Krall and others - sang their favourite songs composed by Joni, and it had been turned into a documentary. Charlie and I went along super early to grab the best seats (it had to be perfect for Joni), drank prosecco, sang along, cried, relived our lives with Joni as the soundtrack. Joni sat in the audience (sadly not ours), her cheekbones still sharp enough to slice a block of cheese, and one by one the singers came out to pay obeisance to the (IMHO) greatest songwriter of our time. As we were going home, I thought about Bach (well it was his 334th birthday), and what he would doing if he were here now celebrating his 75th birthday. If you take the fact that he was a composer essentially working to commissions and strict deadlines (God can be such a taskmaster) and translate that to this time, the likelihood is he'd be a film and TV composer, and composer/arranger of pop songs, although probably more Joni Mitchell than Taylor Swift. And then I got to thinking about the similarities between Joni and Bach, and began to realise that there ae quite a few. Their music is timeless and endlessly fascinating. I have been listening to Bach and Joni since I was 12, and, like Joni's cheekbones, not a note dulls with time. 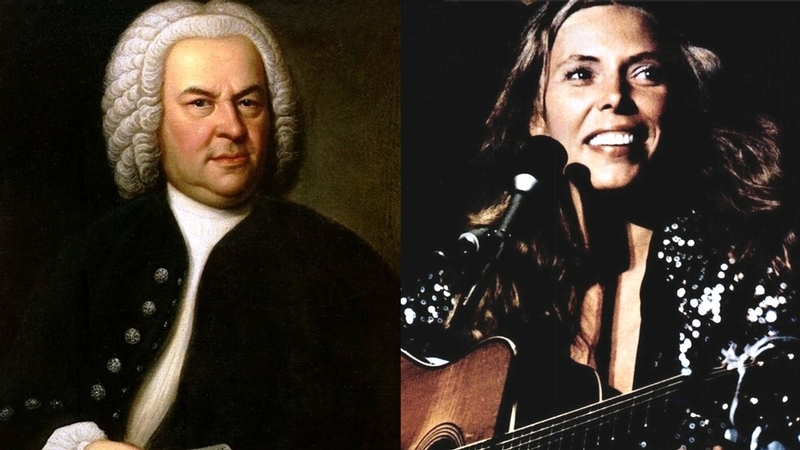 They both had significant childhood trauma - Joni contracted polio at 9, Bach lost his parents when he was 10. They both showed huge tenacity as young musicians, to further their careers. Bach walked 240 miles to hear Buxtehude, the greatest organist of his time. Joni risked the wrath of her mum by quitting art college to do music, and couldn't afford a guitar so bought a ukulele instead to practise. They were both passionate keyboard players and gave early concerts in coffee houses (oh ok, virtually every musician I know has done a gig in a café). Their music is of both their times, but also pushes the boundaries until every last drop of possibility is squeezed out of those pesky rules of harmony. Joni may never have written a cantata, but she did write the holy anthem of the Sixties - Woodstock. And she wasn't even there. Two sides of a single coin. Both sides. Now. This article has been viewed 845 times since being added on March 30, 2019.